Last week's challenge: Think of a brand name you might see on your breakfast table. Change one letter to a Y and rearrange the result to get a familiar two-word phrase that names something else you might see on your breakfast table. What phrase is this? Winner: Andrew Laeuger of New Berlin, Wis.
Next week's challenge: This week's challenge comes from listener Dominick Talvacchio of Chicago. Think of a well-known musician whose last name contains a body part. The musician has a single-word nickname that anagrams to a different body part. Who is this musician, and what is the nickname? If you know the answer to next week's challenge, submit it here. Listeners who submit correct answers win a chance to play the on-air puzzle. Important: Include a phone number where we can reach you Thursday, Aug. 30 at 3 p.m. ET. BLOCK: Joining me as always is Will Shortz. He's puzzle editor of The New York Times and WEEKEND EDITION's puzzlemaster. Will, good to talk to you again. WILL SHORTZ, BYLINE: Welcome back, Melissa. BLOCK: Thanks. And this is not just any Sunday, I'm told. It's also your birthday. SHORTZ: That is true. Now, how did you know that? SHORTZ: (Laughter) As good journalists do. BLOCK: Yes, exactly. What are you doing for your birthday? SHORTZ: Well, my table tennis club has a big tournament this weekend, so I'll be busy all day. BLOCK: OK, great. Well, Will, go ahead and remind us of last week's Puzzle challenge. SHORTZ: Yes, it came from Joseph Young of St. Cloud, Minn. who conducts the blog Puzzleria. I said, think of a brand name you might see on your breakfast table. Change one letter to a Y and rearrange the result to get a familiar two-word phrase that names something else you might see on your breakfast table. What phrase is it? The brand name is Kellogg's. And you make that change - you get egg yolks. BLOCK: Egg yolks. Awesome. Well, we had more than 700 correct responses. And this week's winner is Andrew Laeuger (ph) from New Berlin, Wis. Andrew, congratulations. Welcome to the program. ANDREW LAEUGER: Hi. Thanks for having me. And Happy Birthday, Will. BLOCK: Andrew, you are one of our younger puzzle winners. You're just 17 years old. How long have you been playing The Puzzle? LAEUGER: I've been playing as long as I can remember. I've been listening on Sunday mornings with my dad. And it's been a thing he and I have always done together. And it's great to finally be on it. BLOCK: And now you have won. Dad did not. Is he kind of bummed out that you're on The Puzzle, and he's not? LAEUGER: He was definitely proud of me. But I think he's a little jealous. BLOCK: I don't blame him. I would be, too. OK. Are you ready to play The Puzzle? BLOCK: Will, take it away. SHORTZ: All right, Andrew and Melissa. Today's puzzle is geographical. I'm going to give you some words and phrases. In each one, change two consecutive letters to name a country. For example, if I said sudden, S-U-D-D-E-N, you would say Sweden, changing the U and D of sudden. BLOCK: All right. Here we go. SHORTZ: Number one is frappe, F-R-A-P-P-E.
SHORTZ: France is right, changing the two Ps. Number two is greedy, G-R-E-E-D-Y. SHORTZ: That's it. Canary, C-A-N-A-R-Y. SHORTZ: That's it. Sirocco, S-I-R-O-C-C-O. SHORTZ: Morocco, nice. Bargain, B-A-R-G-A-I-N.
BLOCK: I was thinking Belgium, but that is so not right. SHORTZ: It's got a few letters there. BLOCK: Oh, OK. You want a clue, Andrew? LAEUGER: I was thinking Botswana (ph), but I think I need a clue. SHORTZ: That's a good clue. And here's a second one. Change the R and the G.
BLOCK: There you go. Awesome. SHORTZ: ...I'll tell you - change the E and N.
LAEUGER: Malady. Is it Malawi? SHORTZ: Uh-huh. It's Malawi, isn't it? But you got the answer. SHORTZ: Senegal. God, you're good. SHORTZ: Here's your last one. Came upon, C-A-M-E-U-P-O-N.
SHORTZ: Andrew, I am impressed. BLOCK: I am totally impressed. That was great. BLOCK: And dad will be so proud. LAEUGER: I sure hope so. BLOCK: (Laughter) Well, Andrew, for playing our Puzzle today, you'll get a WEEKEND EDITION lapel pin, as well as puzzle books and games. You can read all about it at npr.org/puzzle. And Andrew, what member station do you listen to? BLOCK: Andrew Laeuger of New Berlin, Wis., thanks so much for playing The Puzzle. LAEUGER: Thank you for having me. BLOCK: And Will, why don't you tell us about next week's challenge? SHORTZ: Yes, it comes from listener Dominic Telvaquio (ph) of Chicago. Think of a well-known musician whose last name contains a body part. The musician has a single-word nickname that anagrams to a different body part. Who's the musician? And what's the nickname? So here it is once again - a well-known musician - last name contains a body part. The musician has a single-word nickname that anagrams to a different body part. Who is this musician? And what's the nickname? BLOCK: All right. When you have the answer, go to our website npr.org/puzzle and click on the Submit Your Answer link. Remember, just one entry, please. Our deadline for entries is this Thursday, August 30, 2018 at 3 p.m. Eastern. Please include a phone number where we can reach you about that time. And if you're the winner, we will give you a call. 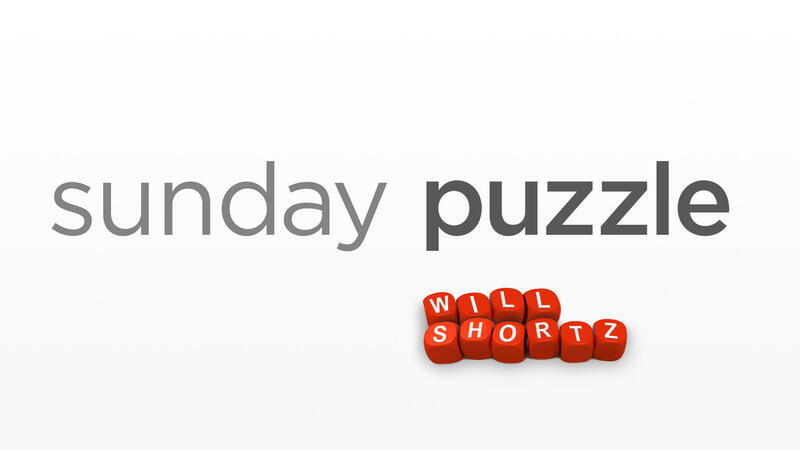 You'll get to play on the air with the puzzle editor of The New York Times and WEEKEND EDITION's puzzlemaster, Will Shortz. BLOCK: Will, talk to you next week.